PaperShaper’s DNA is innovation. We work with corrugated board and create durable marvels in furniture and house hold fixtures. From tables and chairs, to shelves, tube racks, chairs, storage boxes and folders etc. Each of these are aesthetically designed and engineered to carry weight and last for long. PaperShaper products are made of recyclable corrugated board that is engineered for strength and durability. They are lightweight and easy to assemble with no tools. They are ideal for use in hostels where you do not require permanent furniture and fixtures and are a great novelty and a conversation piece. They are easily recycled and do not cause any environmental impact. 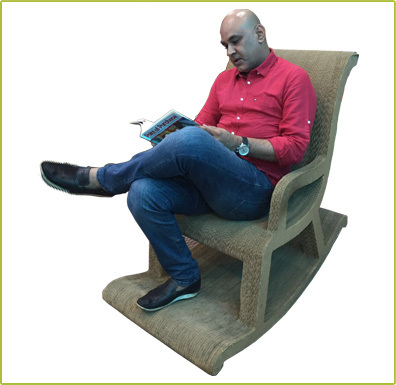 Paper Shaper products are the brain child of the innovative corrugated sheet engineer Mr. Haresh Mehta, whose furniture has become a legend in circles that he is known. Jayna Packaging is a 2nd generation corrugated board and box manufacturer and is known for their innovative solutions for promotions and display. Creating furniture and fixtures with corrugated sheet is a passion of Mr. Mehta and some of his furniture at his office have lasted decades of regular use, attesting to their durability and robustness. Light weight furniture and fixtures that are easy to move around, when shifting is required. Novelty feature that makes it a great conversation starter. Ideal for kids furniture, as they can be recycled at the end of the life cycle.